Called "dead on arrival" by Republicans, President Obama is including the first version of a carbon tax in his 2017 budget request. Charging the oil industry $10 per barrel would fund Obama’s plan to continue decarbonizing the US transportation sector beyond his historic fuel economy standards. With EPA’s Clean Power Plan addressing the electricity sector, Obama is turning toward transportation – the source of 30% of US greenhouse gas emissions. As usual, it’s a matter of priorities and perspectives. Obama views climate change as an existential threat and thus a priority to address through policies. Since climate isn’t an issue for Republicans, they view the move as simply adding costs to an industry that is struggling. Obama also views decarbonization as an enormous opportunity for innovation and jobs. Interesting that yesterday we wrote about how per capita emissions are half of the US in Europe – Obama’s plan includes the elements that make it so: smart growth planning that fosters walking, biking and easy connections to mass transit. 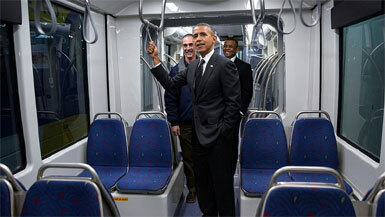 Obama’s plan also includes research investments in clean vehicles and the infrastructure that supports them. The small, $10 tax would be phased in over five years, but it would have a big impact, paying to boost clean transportation infrastructure by about 50% in the $300 billion, 10 year plan. It would incentivize the private sector to reduce reliance on oil, and increase public transportation options, reducing the time people sit on congested roads. $20 billion a year (beyond current spending) would expand transit options in cities, suburbs and rural areas – subways, buses, light and freight rail; make high-speed rail a viable alternative to flying in major regional corridors; allow investments in new rail technologies like maglev; modernize our freight system; and expand the Transportation Investment Generating Economic Recovery (TIGER) program begun in the Recovery Act to support high-impact, innovative local projects. $10 billion a year in grants would be distributed to local, regional and state governments that shift to more innnovative practices. A Climate Smart Fund would give grants to states that are cutting transportation emissions by investing in electric vehicle infrastructure, increased use of mass transit or better land use planning. Three competitive grant programs: one for regional-scale transportation and land-use strategies; one for more livable cities and towns with expanded transportation choices; and one that spurs investments in climate resilience projects. $2 billion a year would support research and development of next generation vehicles and aircraft; support cleaner municipal fleets; and a regional fueling infrastructure for low-carbon vehicles. "For too long, bipartisan support for innovative and expansive transportation investment has not been accompanied by a long-term plan for paying for it," says the White House. "We need a sustainable funding that takes into account the integrated, interdependent nature of our transportation system. Travelers choose between walking, biking, driving, flying, and taking the train; and companies choose between trucks, barges, airplanes and rail lines. So to meet our needs in the future, we have to make significant investments across all modes of transportation. The Transportation bill passed by Congress late last year basically patches an overall decrepit system. The $10 per barrel fee paid by oil companies "raises the funding necessary to make these new investments, while also providing for the long-term solvency of the Highway Trust Fund to ensure we maintain the infrastructure we have." The plan would also provide assistance to low income families to counteract higher energy prices oil companies may pass through to them. At this time of historically low oil prices, many countries are taking the opportunity to stop subsidizing it. But the tiniest increase in gas taxes at the pump can’t pass Congress, impeding our ability to keep up with even conventional infrastructure needs. At $10 a barrel, that could translate into another $0.25 per gallon at the pump. House Speaker Paul Ryan (R-WI) mirrors others in his party when he says, the "president should be proposing policies to grow our economy instead of sacrificing it to appease progressive climate activists," and he knows it is "dead on arrival in Congress." Well, Republicans, if you want to create jobs when the oil industry is laying thousands of people off, how about investing in the transportation of the future? Previous Previous post: Why Do US Citizens Have Double the Carbon Footprint of People in Europe?